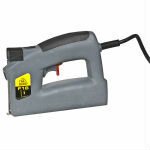 We offer manual, electric and pneumatic picture frame staplers for easel-back application. Easel-back frames require the back easel panel to be secured within the perimeter chop, or frame, either permanently or with the ability to remove in order to facilitate changing of the framed item. For this application we have dedicated framer’s guns, manual and pneumatic, using either brad nails or framer’s soft and/or hard points. The Salco F-18 is a manual picture frame brad nailer. It is all metal construction, using F-18 brads (hard points), 11/16" 18 gauge. The Salco M515 manual point driver takes M515 flexible points, 5/8-inch length. The Salco P515 is a pneumatic point driver that also takes M515 flexible points, 5/8" length. Electric F15 and F18 now available. Have the capabilites and power of a pneumatic tool without having to use an air compressor. RO-MA FP-18 pneumatic picture frame bradder. Uses F-18 brads. RO-MA FP-18 air frame nailer drives brad perfectly flat and tight against back board. Made in Italy. Maestri pneumatic picture frame nailer for "easel-back" picture framing. Uses F15 flex points. 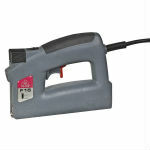 Ro-Ma electric picture frame nailer for "easel-back" picture framing. Uses F15 flex points. 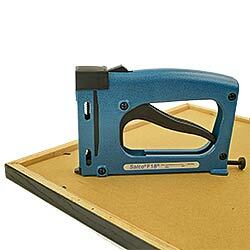 Romaflex F18 picture frame nailer for "easel-back" picture framing. Uses F18 nails/brads, 11/16 inch, 18 gauge.